Home General concepts Overgranulation: when the wound bed is over-activated. Overgranulation: when the wound bed is over-activated. 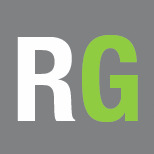 Overgranulation is a problem we frequently find in our clinical practice. However, few has been published about this topic in the medical literature. The aim of this post is to better understand the possible underlying causes of overgranulation and to analyse what treatment strategies may be useful. It is an excess of granulation tissue that rises above the surface in the wound bed and therefore hinders healing. This is an aberrant response with overgrowth of fibroblasts and endothelial cells with a structure similar to normal granulation tissue. It has a spongy, friable, deep red colour appearance. It is frequently present in wounds that heal by secondary intention. Keratinocytes are cells that proliferate and migrate horizontally. 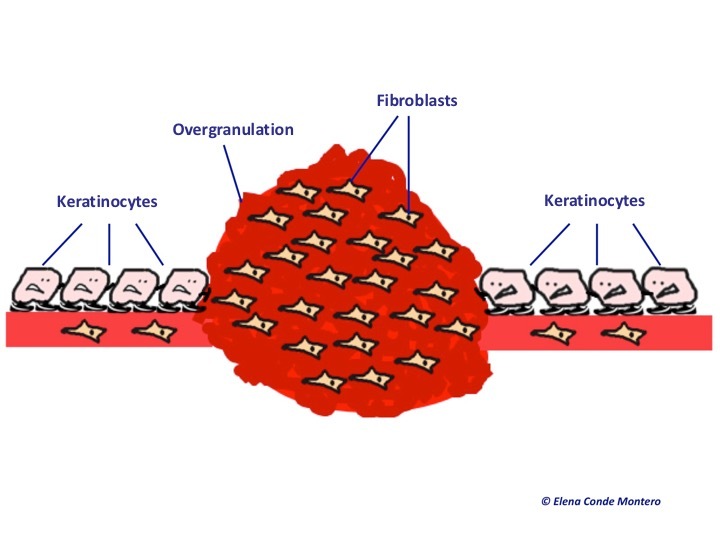 Overgranulation tissue behaves like a mountain that hinders keratinocytes progress on the wound bed surface to achieve complete re-epithelialization. 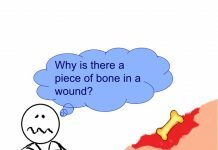 If you want to know more about the physiology of the healing process, you can read the post “Brief overview of wound healing”. Overgranulation in the wound bed can occur for different reasons, which share an excessive inflammatory environment. 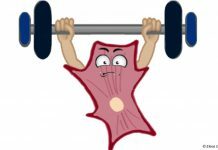 However, the first issue that must be discarded, especially in hard to heal wounds or wounds resulting from burns, is the presence of tumour tissue. We have to suspect malignant transformation when overgranulation is irregular, hard to touch, exceeds the edges of the wound, does not respond to treatment and has months of evolution. If there is any doubt, a biopsy should be performed. In the following image we can see a tumour with a overgranulated surface with a cauliflower appearance. 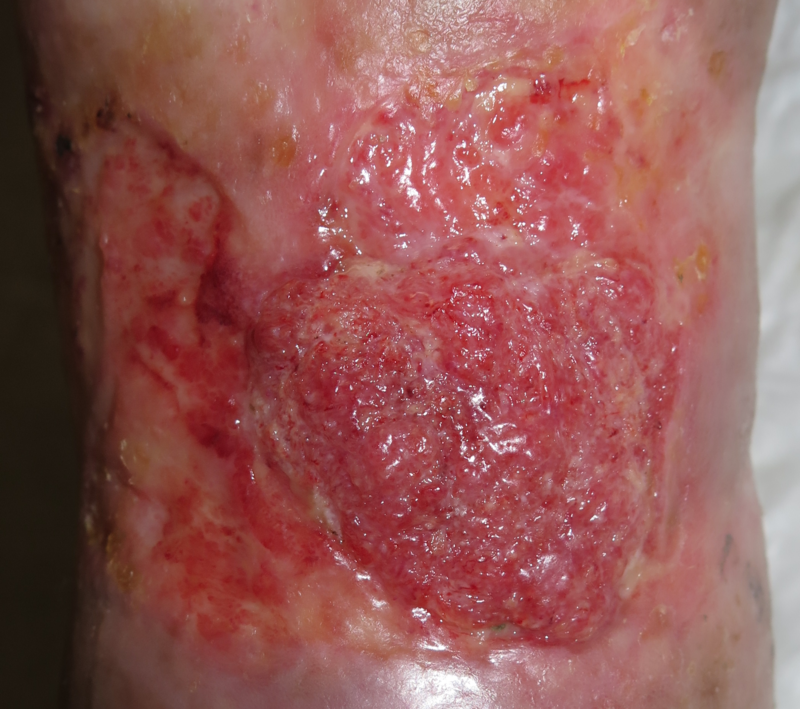 It is an squamous cell carcinoma presenting in a long lasting post burn ulcer. Infection: is usually associated with high exudate, maceration of wound edges and bleeding. Irritative dermatitis, allergic contact dermatitis: secondary to fibres and other components of the dressings and topical products commonly used. Occlusion: overgranulation has been associated with the use of occlusive dressings, such as hydrocolloid dressings. This effect has been associated with several factors, such as promotion of the action of growth factors, production of new vessels to compensate for the local hypoxic environment and increased oedema due to excessive exudate. Friction: in areas of friction with external devices such as ostomy devices or catheters. How should overgranulation be treated? Given the paucity of research work in this area, there is no standardized management of overgranulation in chronic skin wounds. Different treatments have been suggested based on small case series, but well-designed clinical trials are needed to determine and compare their usefulness. If there are signs of infection: the use of products with antibacterial properties is recommended. Further exams may be needed to rule out an underlying abscess. Dressings that reduce humidity and exert pressure on the wound to reduce oedema: change from an occlusive to a non-occlusive dressing, use foams. Silver nitrate sticks: some authors consider it as one of the most effective treatments. However, given that the proliferation of fibroblasts decreases, a prolonged use of these sticks should be avoided. Its use should be limited only to the most resistant areas. Perilesional skin must be protected to avoid a chemical burn. Surgical curettage or excision: not recommended as it may damage healthy tissue, cause bleeding and promote infection. Topical corticosteroid cream: due to its anti-inflammatory effect, the response is usually good when applied for one or two weeks. 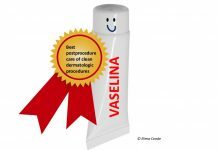 This is the most frequently used treatment in our wound clinic. Other less used treatments: laser, cryotherapy, imiquimod (Lain,2015). What is your experience? How do you handle overgranulation in the wound bed? Chaverri Fierro D. Hipergranulación en heridas crónicas: un problema ocasional pero no infrecuente. Gerokomos. 2007;18(3): 48-52. Hampton S. Understanding overgranulation in tissue viability practice. Br J Community Nurs. 2007 Sep;12(9):S24-30. Lain EL, Carrington PR. Imiquimod treatment of exuberant granulation tissue in a non-healing diabetic ulcer. Arch Dermatol 2005; 141: 1368-70.